Discussion in 'UFC Discussion' started by duncan1244, Aug 22, 2015. I would personally love to see this fight. Who do you guys think would win and how? A few months ago I would have said Bendo. But with Gunnar's improved striking I am leaning toward him now. bendo in what would probably be a lack luster fight that takes place primarily on the feet. not a great matchup to make imo. I'd lean towards Bendo. I think he'd mix his striking and takedowns enough to keep Gunnar on the defence and win a decision. 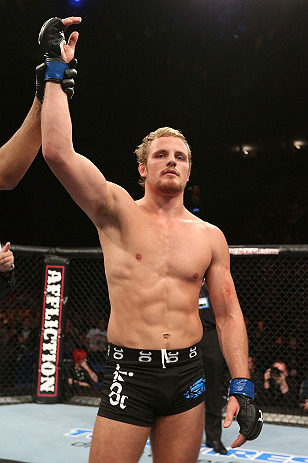 Gunnar wants to fight on the Dublin card and on UFC 194. Bendo has a fight with Alves coming up. If they both win maybe we could see them fight each other at 194. Still though the fight makes sense so why not. Thatch is also a way better striker than Gunnar. We saw how well it worked out for him. Gunni beat Thatch standing, Bendo couldnt, Bendo got subbed by Pettis, Gunni a better submissionfighter than Pettis. Did Thatch even land a strike on Gunnar? I like this match up but I see Benson's wrestling/athleticism giving Gunnar troubles. I would love to see that fight. As others have suggested, Bendo is stronger on his feet, Gunnar has the better BJJ (but Bendo's grappling overall is not as far behind as that would suggest). I hope Bendo does stay at 170...so many interesting fights there for him. But Thatch isn't that great, he is just big, aggressive and undisciplined. I am still not on Gunnar's striking wagon either. He tries to hard to be a karate fighter and it just doesn't work. Rick Story beat him standing, so did his previous opponent. He showed he can't adapt well, he looks for the same counter attack each time, a counter right, but is no where near refined aa striker as McGregor is. He is a good grappler, but still needs much work on his wrestling and striking. Benson would out work him, he still gassed in one round vs Story and Cummings. very white level response. do you have any idea who Benson Henderson is?